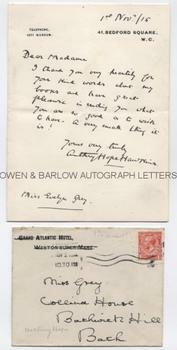 ANTHONY HOPE HAWKINS Autograph Letter Signed. Sir Anthony Hope Hawkins, better known by his nom de plume Anthony Hope. British novelist. Author of 'The Prisoner of Zenda' etc. ALS. 1p plus integral blank leaf. 44 Bedford Square, W.C. 1st November 1915. To Miss Evelyn Grey. 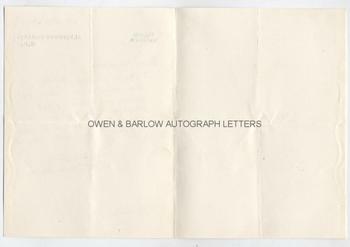 Together with the original envelope addressed in his hand. "I thank you very heartily for your kind words about my books and have great pleasure in sending you what you are so good as to wish to have. A very small thing it is!" 8vo. Approx 7 x 5 inches. In fine condition with slight mounting traces to top edge of the verso of integral blank leaf. Anthony Hope's novel 'The Prisoner of Zenda' and its sequel 'Rupert of Hentzau', both set in the fictional state of Ruritania, are minor classics of English literature and spawned a whole genre of fiction. Since its publication in 1894 there have been countless novels and films that have aped the style of the Ruritanian romance. 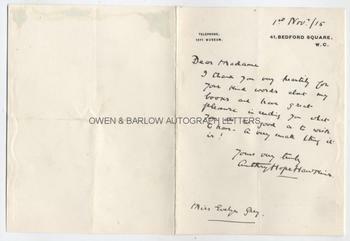 The letter is from the album of Evelyn Grey, a young lady who began collecting autographs to pass the time whilst convalescing in hospital during the First World War. She seems to have had a particular penchant for novelists, as many of the autographs she sought were of popular authors of the day.